La déesse in a stunningly beautiful shade of metallic brown. Zen— no, lustworthy. Our younger selves might have called us crazy, but we really do think so. I have an interesting question to ask: when I was younger as a kid and teenager in the late 70’s and 80’s we all hated this car because it looked so ugly to us. No we all love it. Why? Anybody else had the same experience? the world changes, tastes change. we change. what was once undesirable is now desirable, and vice versa. plenty of stuff the world thought was cool then is probably so tacky and gaudy now, if it hasn’t outright vanished. also, stuff that’s old is now embraced in a way that it never used to be. vintage has never been more en vogue. the DS is an example of something that withstood the test of time. so many other things don’t. Does this imply we will only like today’s things 20 years from now? oh, certainly not. if it’s crap now, it’ll continue to be crap twenty years from now. 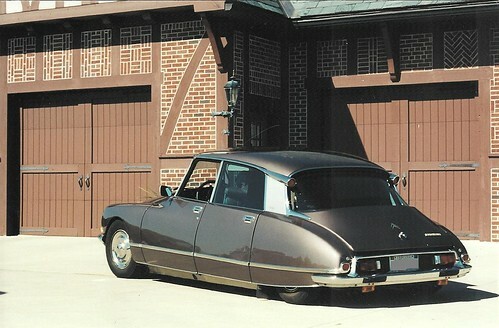 the ds (and others like it, which we were indifferent to then but which we embrace now) was never crap. the only difference is, at that time we just didn’t know it. here’s another thought, specific to this example: this car was too weird for me when i was younger – too different – and i couldn’t appreciate weird things. my thinking was very boxed in. it’s still weird, only now i can appreciate and even enjoy it. Akin to when I was young and stole my first sip of my dads Johnny Walker, I hated it! It burnt my lips and tongue, awful stuff…now pour me glass with a drop of water and I’m a happy man. Ive seen a similar albeit dark shade on newer 911, really nice with a biscuit interior. i believe it’s porsche “macadamia metallic” you are referring to. really nice color. Yes I just googled it and you are correct, really nice. 2010, the world discovers that classic french cars are underratted. Why ? Beacause, each one looked diffrent from every others. i would say it happened well before 2010, actually.